Buy this item and earn 131 ClubPoints. The ultra-sleek ATEN USB-C multiport dock with power pass-through is a one-step total upgrade for your laptop that provides all the extra expansion you need. 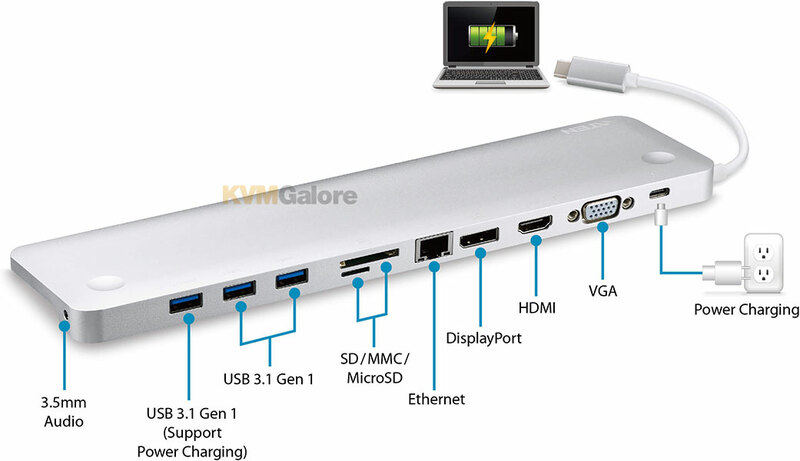 Simply use one cable to add up to 10 devices with power delivery pass-through to boost your productivity with extra HDMI, DisplayPort, VGA, USB 3.1 Gen1, SD/MMC/MicroSD, Ethernet and audio connections. 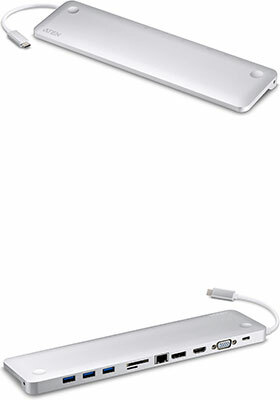 With Power Delivery Pass-Through up to 60W, UH3234 can charge your laptop while connected to the docking station. UH3234 provides power to matched USB-C Windows or Mac laptops with PD Profile specifications of 20V/ 3A, 12V/3A, 9V/3A and 5V/3A. Enjoy stunning 4K video or a dual HD monitor setup with HDMI, VGA, and DisplayPort functionality. UH3234 routes video from a source computer to a DisplayPort or HDMI monitor via a single cable while maintaining the highest quality 4K resolution. You can also mirror or extend your Windows USB-C laptop to two monitors in 1080P. With a sleek, ergonomic design, the docking station's aluminum enclosure makes it lightweight yet rugged, meaning you can place your laptop directly on top of the docking station to save space, type comfortably and keep your laptop cool. Use the single USB-C cable to charge, transfer data and expand your workstation with up to 10 ports. The docking station not only offers the flexibility of three video interface options (HDMI, DisplayPort and VGA), but also it is equipped with readers for SD/MMC/MicroSD memory cards. You can connect a headset/microphone or an array of USB Type-A peripherals, such as external hard drives, or a full-sized keyboard and mouse, to complete your workstation. To keep charging all your power-hungry devices and peripherals while working, the dock provides 60W of power delivery pass-through via your laptop's USB-C AC power adapter. 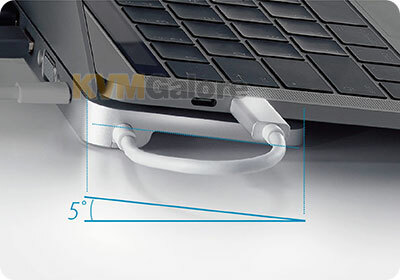 This versatile dock allows to extend your MacBook or Chromebook to an additional monitor and enjoy an ultra high-definition visual experience. You can also mirror or extend your Windows USB-C laptop to two monitors and improve your productivity and get more things done. * With Intel 7th generation Core Processor (Kaby Lake) and above. For video output to work through a USB-C port, it must support DP Alt Mode.Power Delivery Pass-Through requires original USB-C charger from laptop. ** 1. For video output to work through a USB-C port, it must support DP Alt Mode. For Dual-View to work, a computer's graphics card must support MST technology. *** SD and Micro SD Card cannot be used at the same time; functionality accords to the order of insertion.